WEsay Pretty tree lined runs and a quiet but friendly village centre, this resort is very family friendly and has a traditional feel about it. 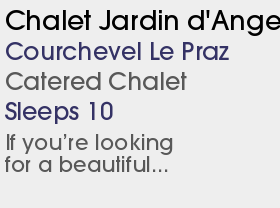 Le Praz, (formerly known as Courchevel 1300), with its winding streets and traditional chalets, is the prettiest of the Courchevel villages and offers a quieter atmosphere, making it ideal for families. Access to and from the resort is easy with the choice of an efficient bus service, the lift system or the beautiful tree-lined runs down from the other levels. 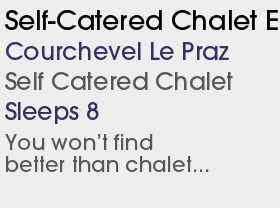 The two main gondolas provide easy access to the Croisette area and Foret which leads via the Col de la Loze to Meribel. Despite the peaceful nature of the village La Praz boasts some fine restaurants, including 'Le Bistro du Praz' one of the most famous restaurants in the Three Valleys, and a number of popular bars. Courchevel Le Praz has a great selection of bars including L'escourchevel also known as the Sports bar, which serves great reasonably priced food and has live entertainment on many nights. In addition there is the Cave de Lys, an atmospheric vaulted wine bar that is in a great quiet spot and serves tapas style snacks. 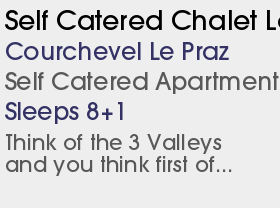 Le Praz also has a good selection of supermarkets and shops which are all just minutes away from our range of ski chalets in Courchevel. The big news is in Moriond (1650) where the long-promised replacement Ariondaz gondola from the village to Bel Air will be in place for 2017/18. The old 6-person cabins will be replaced smart new 8-seaters and it will be the first gondola in France to be lit inside and out using power supplied by on-board solar panels. It will carry 2400 people per hour (twice as many as the old one, so cutting peak morning lift queues) and the ride time will be cut from 12 minutes to seven. The run back to the village will benefit from smart new state-of-the art snow cannon some of the extra 115 that will be installed in the Courchevel ski area for this season. A new 3km toboggan run has been built from top to bottom of the new gondola. It has eight underground tunnels and will be open every day and be floodlit until 7.30pm on Tuesdays and Thursdays. Further major investments in snowmaking were made. The already impressive children s village was further developed and is now the largest children’s village in France, covering over 12 acres of trails and specially decorated lifts. It also has a nuresery, games area and a dining room. As part of the Handiski scheme to make snowsports accessible to disabled people, 75% of lifts are now adapted for people with disabilities, a dedicated teaching area for people with disabilities has opened at Pralong above 1850 and eight specially qualified instructors are available. Extensive, varied slopes many visitors don t bother with the rest of the Trois Vallées Impressive snowmaking and piste grooming, and a decent lift system Partly wooded setting means you have options in bad weather Choice of four very different villages Some great restaurants and top-notch hotels and plenty of non-swanky options in lower villages like La Praz.